How complex you make your walls is determined only by your construction abilities, the amount of labor that you have access to, and your purse. Last time we talked about the basic rope and fabric walls. The next step up from these walls is simply scaling them up and adding a formal gate. So, what do I mean about scaling the wall up? Here is an example. This wall was in the process of being set up when I took this photo. Privacy and access to the camping area is controlled by fabric, but the fabric supports have been turned into impressive columns. When the wall is completed all of the open spaces except for the gate are covered with fabric. The next camp wall uses the same principal – gorgeous columns with simple fabric panels that create an impressive façade for the camp. The next step up from this approach is adding some sort of special panels to replace the fabric. In the case of this Japanese encampment the main gate is surrounded with panels that are designed to look like Shoji screens. I have also seen encampments that use panels of stockade fencing, wooden trellis panels and even manufactured plastic stone panels for the same purpose. Aside from improving the quality of your walls, the other major focus can be your gate. In the case of the Japanese encampment, a Japanese style gate, combined with Japanese banners, completes the presentation. 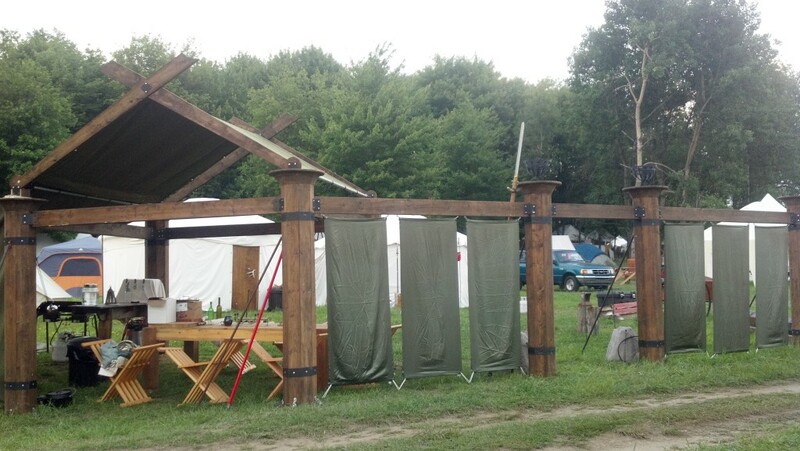 The simplest sort of gate arrangement is demonstrated by the Drachenwald encampment. 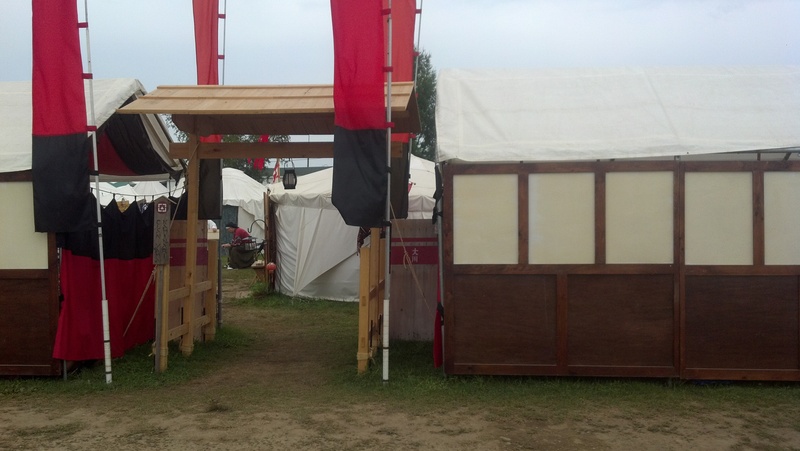 Two simple uprights with a board across the top with the encampment name. Like walls, gates are limited only by imagination, building skills, money and manpower. Take this small monument for instance; each side of the gate is actually a shower stall. The walls are simple fabric squares, but the overall effect is still impressive. 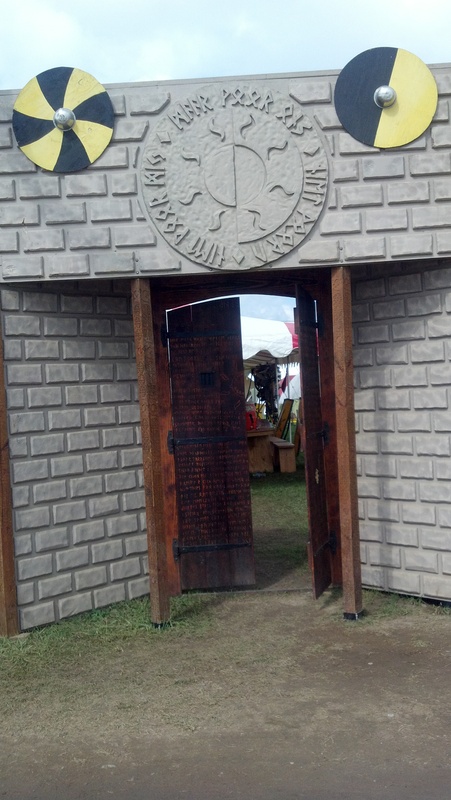 This camp creates a monumental front entrance way, using quality plastic formed stone wall sheets, and then sets a very impressive wooden door in the entrance to finish the effect. 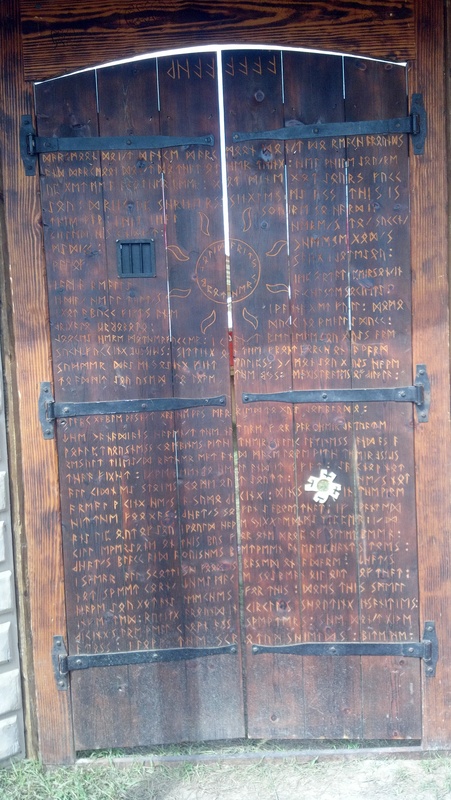 And an up close shot of the door, complete with a complex Anglo Saxon rune inscription. Another approach that requires considerably less construction and can be very functional is to place either one large tent, or two small ones at the edge of camp as a gate. 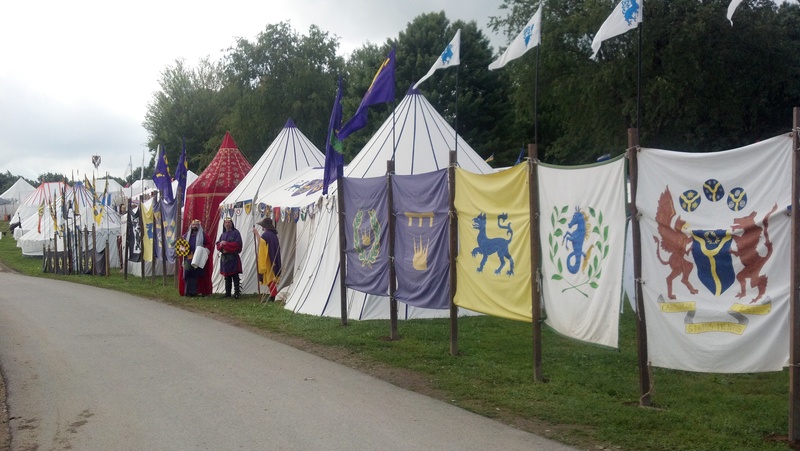 This picture shows the entrance to the East Kingdom Royal encampment. The sheet wall provides some privacy and traffic control and the two white round marquee tents flank the entrance. There is actually a fly that is hung between them and provides shade, and protection from rain for those waiting to enter the encampment. 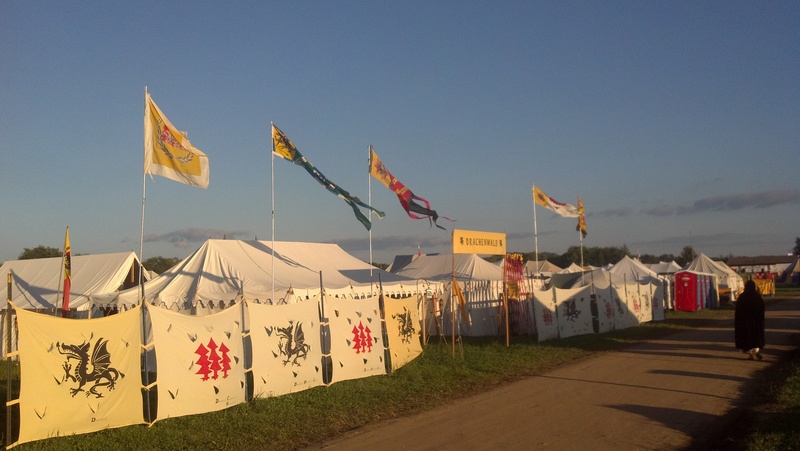 There are several examples of this arrangement at the Pennsic War. 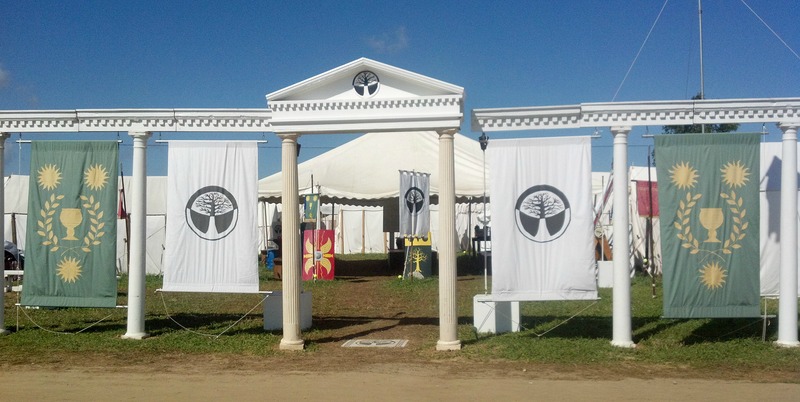 Using a large pavilion as the gate, and a common area for the encampment, means that anyone entering camp has to pass through the tent. This makes it easy to control access to the camp and for visitors to connect with any household members in the communal tent.